COLUMBUS, Miss. – Dr. Phillip Stockton, assistant professor of music education and director of choral activities at Mississippi University for Women, was honored as the university’s 2019 Excellence in Diversity and Inclusion Award recipient. He was recognized at a campus luncheon attended by university administrators, faculty and staff representatives, past award recipients, students and guests. Dr. Stockton, who joined The W in 2013, was praised for uniting students though music. He has built a program of inclusiveness, welcoming a broad diversity of majors and backgrounds and imbuing each student with a sense of pride, responsibility and accountability. During his tenure, the Women’s Chorale alone has grown from eight students before he started to 29 students last year. He also oversees the university’s Chamber Singers and the music education program. He was noted for incorporating various styles of music, including African-American, Native-American, African, South American and Eastern European into his programs. He believes it is his responsibility as a professor to teach students about diversity through exposure to different cultures through music. He has said that his goal “is to help each student grow not only in ability but in character by teaching responsibility, professionalism and accountability.” Stockton has also created partnerships with local schools to give music education students at the university hands on experience in the classroom. In summer 2018, he traveled to Kenya, where he studied, worked with high school students and conducted the Nairobi Chamber Chorus in AVoice4Peace. As part of that scholarship, he incorporated Nigerian music for the students to perform recently at the university’s holiday concert, entitled “Noel.” When studying and performing the piece, Dr. Stockton had the students incorporate traditional dancing and drumming using percussion instruments, such as the cowbell and congas. He shared that learning led to excellent conversations about authentic performance and trying to embrace the culture of another. Not only is Dr. Stockton supportive of students, he is extraordinarily supportive of the university through its fundraising programs. He has taken W students around the state and region to perform for alumni, which provides exposure and learning opportunities for the students (some of whom had never traveled outside Lowndes County) and provides engagement opportunities for alumni. He has shaped a cohesive group that showcases the highest degree of talent, and through his mentorship, they are outstanding ambassadors for The W.
Dr. Stockton has also exposed students to cultural diversity through study abroad in Scotland in 2016. In addition to their classroom studies, students were able to explore an entirely new culture and perform in Edinburgh’s historic St. Giles Cathedral. For many, this was the first travel experience outside of the State of Mississippi. Following that, he returned to Scotland in 2017 with the Chamber Singers, where they recorded “Lux Aeterna” in renowned Greyfriars Kirk in the heart of Old Town Edinburgh. In the community, Dr. Stockton is equally generous in sharing his talents. He is the artistic director for the Columbus Choral Society. Since 2014, he has served as the director of music at Beersheba Cumberland Presbyterian Church on the Board of Directors and is on the Board of Directors for the Columbus Girls Choir. He is actively engaged in community service work involving the elderly, the food insecure and abroad. He is planning a mission trip to Central America later this year to incorporate music into the curriculum for a grade school in Belize. He has coordinated the music for the Martin Luther King, Jr. Day of Service, a local celebration which is a partnership between the university, Columbus Air Force Base and City of Columbus. His work with this event compliments his growing body of research that has focused on civil rights music, specifically documenting the Alabama Christian Movement for Human Rights choir in Birmingham during the 1960s. His research shows how the civil rights movement, and particularly many marches, began in local churches with the choir singing and then transiting into the streets. Each year IHL gives each university the opportunity to nominate one individual for the IHL Excellence in Diversity and Inclusion Award. 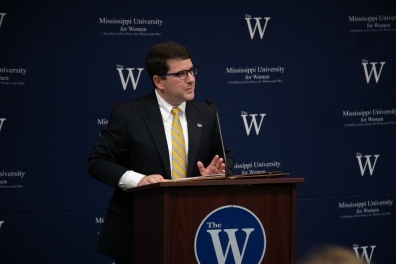 Nominees are evaluated based on positive contributions to the campus and the state, including advancing diversity on campus and within the university campus community, exemplifying service universities provide to local communities and the state and demonstrating accomplishments that have benefited all Mississippians. Each university nominee will be recognized in conjunction with the IHL Board meeting Thursday, Feb 21.